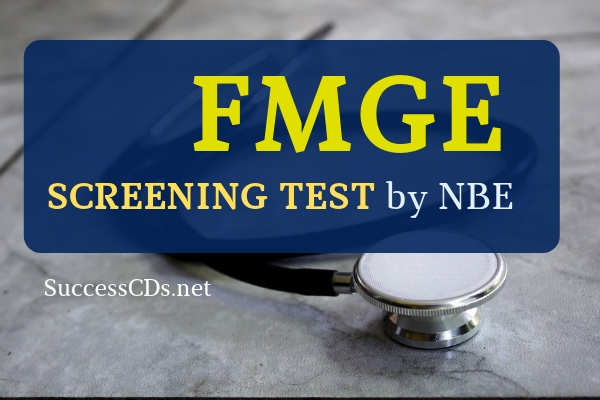 FMGE 2019 Screening Test - National Board of Examinations invites applications for NBE FMGE Screening Test for Indian Nationals with Foreign Medical Qualifications June 2019. According to the notice Foreign Medical Graduate Examination (FMGE) - Screening Test is schedule for 28th June 2019. National Board of Examinations announces Foreign Medical Graduates Exam June 2019. As per the Screening Test Regulations 2002, an Indian citizen possessing a primary medical qualification awarded by any medical institution outside India who is desirous of getting provisional or permanent registration with the MCI or State Medical Council on or after 15th March 2002 shall have to qualify the Foreign Medical Graduate (FMG) Exam (Screening Test). National Board of Examinations will conduct next FMGE (Screening Test) on 28th June on Computer Based Platform at various test centres across the Country. He/she is a citizen of India or Overseas Citizen of India. It is mandatory to provide proof/documentary evidence in support of the candidate having passed final exam for such a primary medical qualification/possess the primary medical qualification on or before the cut-off date. In the event of the date of issue of result/proof of primary medical qualification being after the prescribed cut-off date, the application form shall be rejected and candidate declared as ineligible. Candidate seeking provisional or permanent registration shall not have to qualify the Screening Test if he/she holds an Undergraduate medical qualification from. Australia/Canada/New Zealand/United Kingdom/United States of America and the holder thereof has also been awarded a Post Graduate medical qualification in Australia/Canada/New Zealand/ United Kingdom/United States of America and has been recognized for enrolment as medical practitioner in that country. There are 300 multiple-choice questions (MCQ) of single response. Candidates are required to report at the ‘Reporting Counter’ at 07.30 AM for Part One and 01.00 PM for Part Two (Two hour prior to the start time). The reporting counter will close 30 minutes prior to the test start time. Candidate who fails to report to the reporting counter by the stipulated time as indicated above shall not be allowed to test. Note: FMGE exam 2019 is divided into two parts of 150 questions each with time allocation of 150 minutes for each part. There is a scheduled break between the two parts. Application Form for FMGE June can be submitted only through online at www.nbe.edu.in form 15th April 2019 to 06th May 2019 till 23:59 hrs. There is no option for submitting the form other than the online mode, offline applications or printed copies will not be accepted. Candidates are advised to read the Information Bulletin carefully before starting online submission of application form . Candidates are required to submit the aforementioned self attested scanned documents through web portal at www.nbe.edu.in latest by 6 May 2019. Fees shall neither be refunded nor carried forward if the application for FMGE is rejected/candidature is found to be ineligible. At the time of submission of online application form, candidate will be required to choose the city in which he/she wants to take the test. The choice of city will depend on availability of the test centres in a particular city and the allotment shall be done on first come first serve basis. NBE will make all efforts to ensure that the candidate is allotted a testing centre in the State of correspondence address of the candidate. In case testing seat is not available in the concerned State due to logistic, administrative and other reasons, testing centre in a nearby State shall be allocated. Such candidates shall be informed about their testing city.